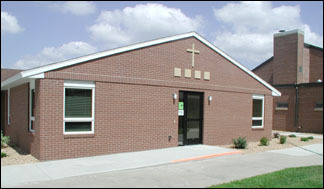 Construction was recently completed on a new office addition to the St. Louis Catholic Church. The addition will centralize all offices as well as provide additional space to meet anticipated future demand. "It facilitates our better working together since we're all in one location," said Father Richard Leisen. In the past, the religious education offices were located in the front of the church, and the main office was located in Father Leisen's rectory. "It leaves the rectory as a place to live, with more privacy," said Liesen. "I've gotten along alright this way so far, but there was no room for future expansion." The church will now be able to meet the need for space, which will be created if additional parishes become the responsibility of the future St. Louis pastor, said Leisen. The original cost of the project was estimated at $195,000, but, according to Leisen, the final cost will actually be significantly less, at around $135,000-$140,000. "A good amount of money that's going to be paying for this is on hand," said Leisen. "We don't have to borrow any money or anything else. It will be covered with existing funds." Construction on the project began in April. Brick repairs and other things were also done as part of the project, and with the exception of some outdoor landscaping, everything is completed. Leisen said construction went speedily, with M&M Lumber taking care of the coordinating, and the contractors did their work well. "A high percentage of the workers were parishioners, and I think they took pride in their workmanship," said Leisen. "We had a lot of support from the parish to do this." An open house is being planned, but a date has not yet been set. According to Leisen, the completion of the new office addition marks the final project of the church's long-range planning, which included adding a youth minister, repairing and renovating the organ, fixing the ceiling in the parish hall, adding another cemetery mausoleum, and preparing for the possibility of a deacon. "We're doing more with youth, and we're talking about more adult parish education," said Leisen.